Features an enlarged section for Central Mexico (1:500,000 scale) and maps of Belize and Guatemala as well as coverage for all of Mexico. This atlas is perfect for travel to Mexico and a great companion to your GPS map. 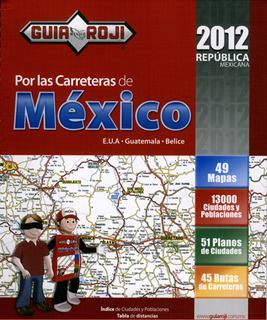 Time and distance tables are included as in previous editions as well as 45 Highway Routes showing each of the principle routes taken through Mexico (e.g. Mexico City - Guadalajara). Length of trip, toll booth locations, gas stations, highway intersections, panoramic vistas and auto mechanics are just some of the characteristics shown along the way. The atlas includes an index of approximately 13,000 locations and maps of 51 cities. Each year more of the new toll roads through Mexico are added to the atlas making it an indispensable tool for travel to Mexico. 8 1/2 x 11 inches. Scale 1:1,000,000/1:500,000. Select any of the other 0 items in Atlases below for more information.